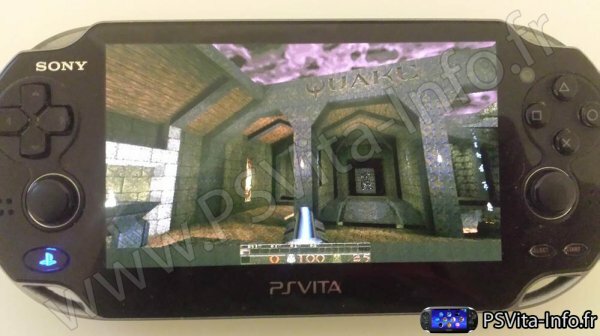 VitaQUAKE comme son nom l'indique, est un portage du jeu FPS Quake, sur PS Vita, en utilisant rejuvenate ou HENkaku. C'est basé sur WinQuake, et vous pouvez (et devez) utiliser le fichier pak1.pak shareware (démo) ou du jeu complet. - Improved Livearea elements (icon and startup banner), thanks to Ch3lin. - Improved analogs aim and deadzone (Thanks to rsn8887). - Centered end level screen score. - Minor bugfix in "Show Weapon" voice not being properly ordered in Options menu. - Several bugfixes in the renderer, now everything works as intended. - Fix for underwater shadows, now they get rendered as expected. - Added support for colored lights in .lit format. - Added "Bilinear Filtering" in options menu (Enabled by default). - Fixed a bug causing homebrew to crash on startup if official missionpacks where shipped in data files. - Fixed a bug causing mods and missionpacks to use original Quake soundtrack. Now they use their own soundtrack files. - Added launchers for official missionpacks on vitaQuake Livearea bubble. - Fixed particles rendering. Now it works as intended. - Fix for chase camera rendering. Now it draws the player correctly. - Fix for mirrors rendering. Now they correctly reflect scene. - Added Quake 3 boobing effect to pickups. - Fixxed v_gamma command, now it correctly changes game brightness. - Increased max texture size from 1024x1024 to 4096x4096 (sceGxm hardware limit). - Added specular mode for Quake veteran challengers (gl_xflip). - Re-worked Options menu to have all new vitaQuake features.